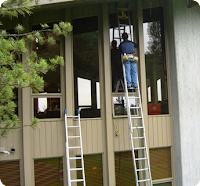 "Window Defoggers did an outstanding job in replacing the glass in our 48 Weathervane wood windows with failed seals. Jon and his crew were very competent and skilled in all aspects of the operation. 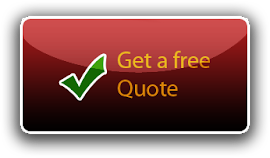 "I found Jon easy to work with, informative and very professional in all aspects of the estimate negotiation as well as the final installation. I particularly appreciated his willingness and efforts to accommodate my desire to see the end result of his work and talk to previous customers before committing. "Bottom line...everything exceeded my expectations. The Window Defogger approach is a very cost effective and minimally disruptive way to replace failed Weathervane wood windows." "My windows have been in about a month now and I still can't beleive what a difference they make to the total look of my home! I was astonished when I walked in from work the first day they were in, but I continue to be amazed. I love them. New glass changes the look of everything. The suggestion to change from grided to non-grided was a good one, and gave my house an updated look. The original wood windows are still beautiful. They just needed a facelift with new glass!" We just went through a careful look at how best to do deal with failed windows. Please pardon my not-too-brief response, but I've been meaning to write about this for a while. Every single house in our development has this problem, and the costs to repair windows can be outrageous. All the houses were built with Weathervane wood windows. Weathervane is out of business now (and that's probably a good thing!). There were so many bad things about those windows, from the material to the workmanship, that they were all bound to fail in the 10 to 15 year timeframe, especially the windows that see a lot of sun. You can't buy Weathervane windows anymore -- from anywhere. 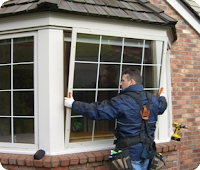 If you have fogged glass or rotten wood, you have to go elsewhere to get them replaced or repaired. 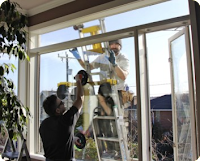 The bottom line is this: contrary to what you may be told by many of the big window companies here and nationally, these windows *can* be repaired. The glass can be removed from those wood sashes, and new glass, that exactly matches what came out, can be installed in the original sashes, and no one will ever be able to tell. The mullions can be matched, as can the dimensions, and all the details. The new (and local) suppliers of glass now make the glass and seals better than in 1987-1990, when these were built. The glass comes with at least a 10 year guarantee by the glass manufacturer. 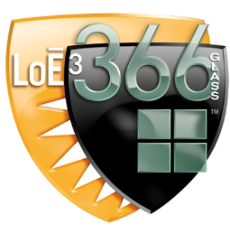 You can get the windows made with "Low E" glass to save on energy. And if you want to (or have to)replace the wood sash (which surrounds the glass), that can be done very reasonably as well, without having to change the window sill, brick molding, or interior trim. Of course, if you're itching to spend the big bucks and have everything replaced, that's readily available, but we found that doing so costs 3-4 times more than just fixing what needs fixing. And I'm absolutely sure that the difference you'll pay by following the expensive route will not be paid back when if/when you sell your house. In January, we had 13 windows replaced for just over $5000. In our case, all the wood sashes were replaced too, partially because the new sashes came with "window stops" that permit easier replacement of the glass in the future. And the new sashes were made of fir, which is more durable than the pine that was used by Weathervane. We had Low E glass used, which costs a bit more (and has a slight greenish tint) but were happy to have the benefit and were not concerned about the tint. We had estimates from other vendors that ranged from $12,000 to $20,000 for the "same" work, though some of the higher estimates (from Anderson and Pella) involved replacement of more than just the window sash -- which we didn't need or want. But they all made it sound like we had no choice but to go whole hog. Also, some of these companies offer "lifetime" guarantees, which I found can be rather bogus as well, and probably shouldn't be considered to be a big selling point. To do this work, we used Seattle Window Defoggers LLC. Their shop is in Redmond. Their email is seattle@wefixfoggywindows.com, and their phone is *(425) 643-4444. They are knowledgeable, responsive, honest, and not pushy. And they do the installations in-house, with their own long-term employees. In all my years of hiring contractors for various tasks, I've never found someone I liked better. "I wanted to thank you for very promptly and expertly fixing the window and going the extra mile. We're thrilled with our windows and are enjoying the additional light, clarity and "clean-feel" in all of the rooms where you worked." "I just wanted to thank you folks for a job more than well done. Defoggers is a good choice because our windows that had sweeping, smudging, thought I was going blind, are my glasses dirty, are my contacts shot views went to a sweeping, crisp, clear, gorgeous sound view. You guys not only improved my view, you were fast, efficient and friendly. Your price was MORE than reasonable. I promise you when and if I ever need to replace ANY windows in ANY home, I will call you!!! Again, thanks so much." "Thank you for your service. Our home sale closed Friday, and the windows looked great. I think of your tagline as "Responsive, Reliable, & Reasonable!" I'll be happy to refer future customers to you. 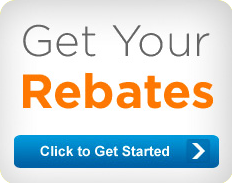 I learned a lot from our conversations, and am a satisfied customer." "I had a house window broken during a recent burglary. Of the many things I needed to do after this unfortunate event, I had to find someone to replace a broken window. After Googling "window repair," many businesses in the Seattle area were listed. 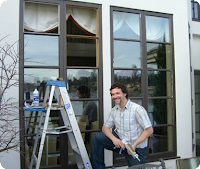 I have never had any experience with window repair and I had no idea who to call. I called two business and left a message. Window Defoggers called me back within 30 minutes. They were able to come to my house, measure, and order the replacement window within two hours. The glass was ready for installation a few days later. Window Defoggers was able to repair my window and also clean up all the broken glass as promised, on time, with no hidden fees or costs. I would highly recommend them and also use them for any future work."